NASA’s decommissioned Upper Atmosphere Research Satellite fell back to Earth at 12 a.m. EDT (0400 GMT), as Friday, Sept. 23, turned to Saturday, Sept. 24 on the United States east coast. The Joint Space Operations Center at Vandenberg Air Force Base in California has determined the satellite entered the atmosphere over the Pacific Ocean at 14.1 degrees south latitude and 189.8 degrees east longitude (170.2 west longitude). This location is over a broad, remote ocean area in the Southern Hemisphere, far from any major land mass. The debris field is located between 300 miles and 800 miles downrange, or generally northeast of the re-entry point. NASA is not aware of any possible debris sightings from this geographic area. 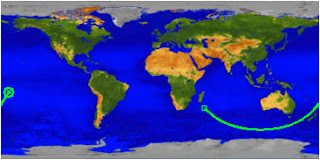 This NASA map shows the ground track for UARS beginning in the Indian Ocean off the coast of Africa at 0330 GMT and ending at atmospheric interface over the Pacific Ocean at 0400 GMT.